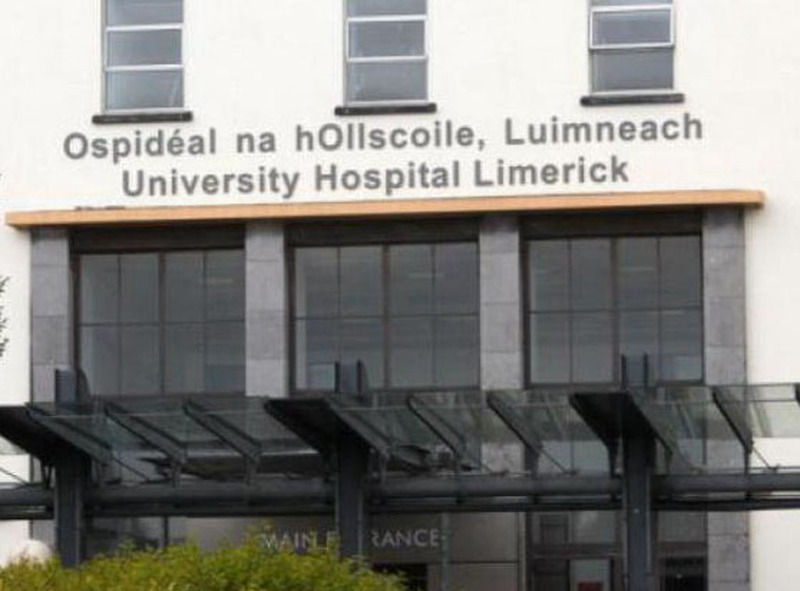 Clare County Council has beaten off competition from across the island of Ireland to be named winner of the Charles Thomson Award, an annual award scheme which recognises the work of Local Authorities in promoting water safety. Irish Water Safety (IWS) and the Republic of Ireland and Ulster branch of the Royal Life Saving Society (RLSS) presented the award to Clare County Council at a ceremony in Dublin attended by Councillor Paul Murphy (Leas Cathaoirleach), Pat Dowling (Chief Executive), Anne Haugh (Director of Services) and Clare McGrath (Clare Water Safety Development Officer). The Charles Thomson Award scheme organisers commended Clare County Council for its work in promoting water safety during 2015 including the completion of new lifeguard, training and public facilities at Whitestrand Miltown Malbay, the securing of a record number of International Blue Flags in spite of the damage caused by storms al local beaches during the previous year, the ongoing provision of professional training and upskilling opportunities for Clare lifeguards, and the allocation of funding to local community search and rescue organisations. 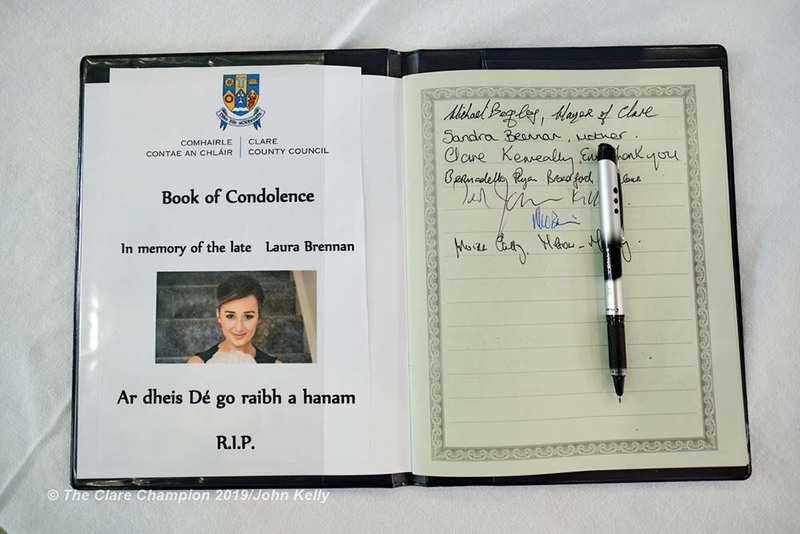 The Local Authority was also complimented for its introduction of new water safety signage and information at bathing locations and along waterways, as well as its promotion of water safety information in the local media and in communities across Clare. 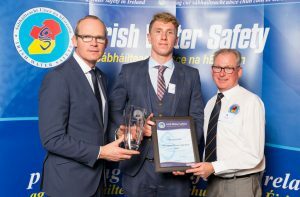 Simon Coveney TD, Minister for Housing, Planning & Local Government presents the Sports Persons of the Year Award to Bernard Cahill (22) from Ennis flanked by Seamus O’Neill, Chairman of the IWS Sports Commission at the annual Irish Water Safety Awards held at Dublin Castle. 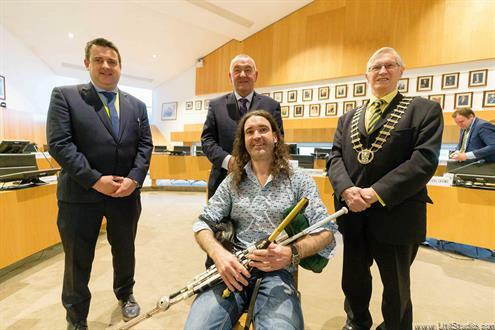 Meanwhile, Clare County Council lifeguard Bernard Cahill was named IWS Sports Person of the Year. 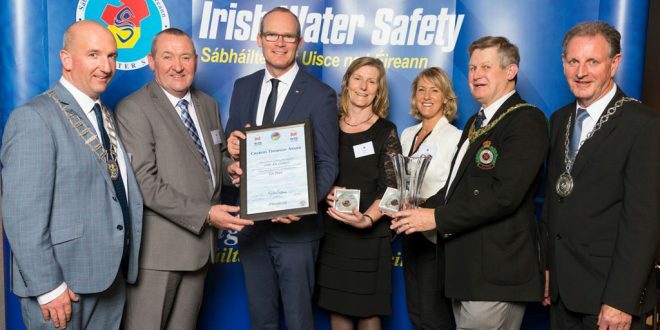 Commenting on the Award, which was based on water safety activities initiated during 2015, Chief Executive Pat Dowling paid tribute to staff for promoting water safety through a series of educational initiatives in Clare schools, training programmes and through the media. Mr. Dowling remarked on the promotion of water safety at Clare beaches locations following the devastating storms of 2014. “It was a serious challenge to ensure all beach goers were in a safe environment during the ongoing reconstruction works on the west coast. The storm damage was unprecedented with many infrastructural projects continuing through the summer months. The awarding of a record 9 Blue Flags to Clare beaches during 2015 underpinned the work that was undertaken by Council staff to promote water safety,” he added.